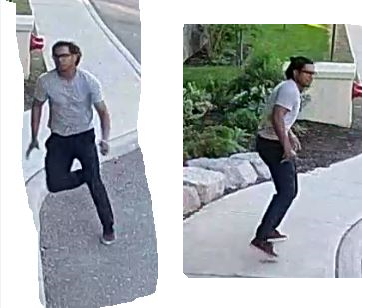 New footage has been released regarding a sexual assault that took place in Brampton. The incident happened around 7:45 p.m. on Friday, June 1 at a convenience store in the area of Kings Cross and Knightsbridge Road. Police say a male suspect approached a 23 year old woman and attempted to make conversation with her. When the victim left, the suspect allegedly followed her in a silver vehicle. The suspect again approached the victim and sexually assaulted her before fleeing in the silver vehicle, police say. In the video, the suspect can be seen approaching a woman, who is walking with a child, from behind. The suspect appears to assault the victim, begins to leave, then runs back and physically attacks her. The victim throws a drink at the suspect before he flees the scene on foot. The suspect is described as a South Asian male, approximately 30 years old, 5’7, with a medium build and glasses. He was wearing a grey t-shirt and dark pants. Anyone with information related to this incident is asked to call the Special Victims Unit at 905-453-2121, ext. 3460. Information may also be left anonymously by calling Peel Crime Stoppers at 1-800-222-TIPS (8477) or by visiting www.peelcrimestoppers.ca.